This episode is the first of a two-part series on hiring and firing in PR and marketing agencies. Chip and Gini offer advice on when to hire and some guidelines on how to make the process most effective. 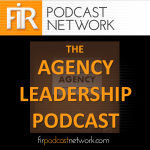 With the shape and size of agencies changing significantly in recent years, the show explores things like whether to use contract help versus in-house employees, hiring in a virtual environment, and how to be competitive in the process. Next, the co-hosts will look at the flip side: when and how to fire employees. It’s not a pleasant topic, but it’s one that agency leaders need to confront periodically.